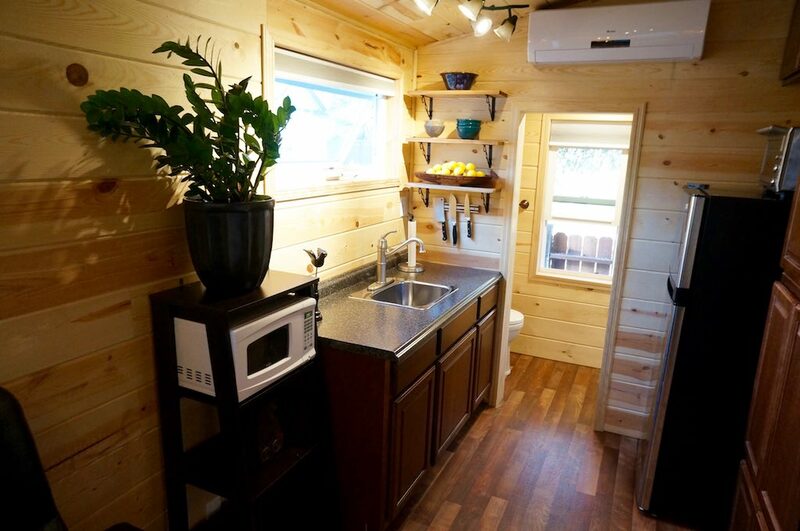 A 240 square feet tiny house mounted on a 5th wheel trailer in South Pasadena, California. More info. here. The sleeping area 5th wheels provide is a good compromise for those of us who can’t clamber into lofts, and provides plenty of space. I suppose switching out the double barcaloungers aimed at the TV would make it seem less cold, shall we say. It looks comfortable but not comforting. Personal touches will help, but nothing to be done about the narrow windows, generic granitesque countertop & cabinets. Shorter people can’t even look out the window while doing the dishes. And from the outside, looks unfriendly. 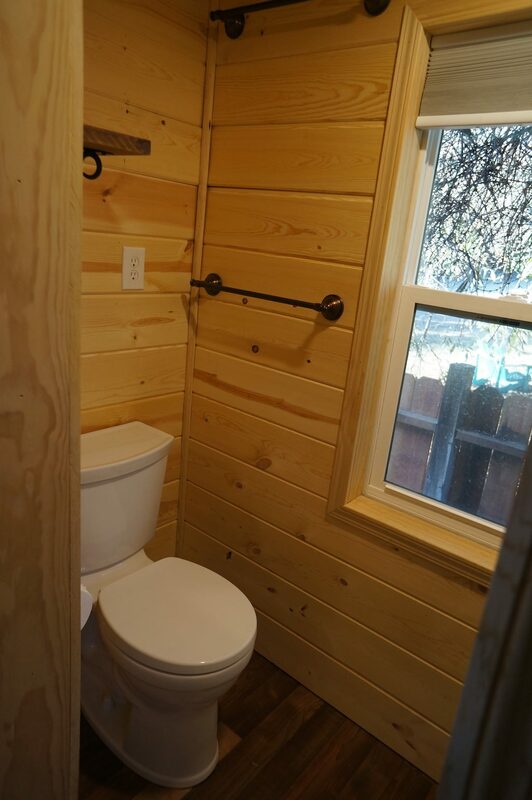 I’m sorry, but the builders really need to think harder about window placement. I suppose it would be OK for a mancave. Chairs, TV, Brewskis. No one wants to to look UP while watching TV. There’s no sink in the bathroom. It looks cheap, like all the materials came from Home Depot. Kathy’s right, perfect for frat boys. I’ve had a fifth wheel, tiny house design (250 sq.ft.) laid out on paper for over a year, no tiny house design out there has even come close to mine..I’ve even had a tiny house builder look at it and say it would work, he could build it off my chicken scratch.. One day I hope to build it.. this design is basic and needs a better thought to the living space lay out for sure..not enough windows and the bedroom needs some kind of privacy..the whole house is good, it does need that specific touch by a loving owner though. 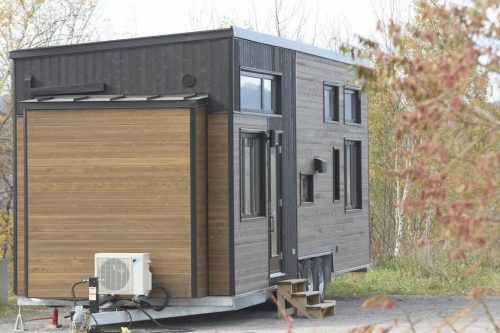 Share your plans and we will see if “no tiny house design out there has even come close to” yours. What is your claim to fame? Maybe someone will want to pick up your design? Love the decent sized fridge, and actual area to sit and watch TV (you’d be surprised how many tiny houses on this site lack that), and an easily accesible bed. Is that storage I see under it? Nice. I do agree it’s a bit plain on the outside, perhaps an accent color or strip or a bar of corrugated metal to give it some personality. I know some people dislike the corrugated metal but I like it. EDDY: For what it’s worth, I believe that is a free-standing oven sitting on top of the refrigerator. 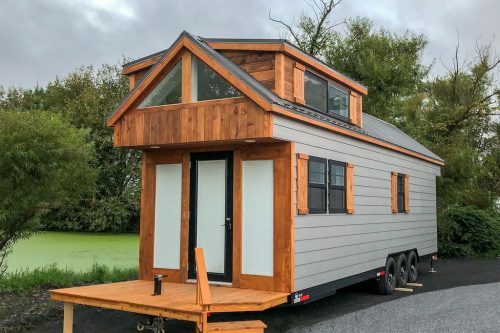 Otherwise I agree with most of the other posts in that it is not most well-thought-out or executed tiny home I’ve seen — and I’ve seen thousands of them over the last 30 years. It needs more windows for a start. Just saying. . .
the viewing angles and distances for tv watching are well known and freely available. The placement here is such to cause intense neck pain. the recliners are ghastly. 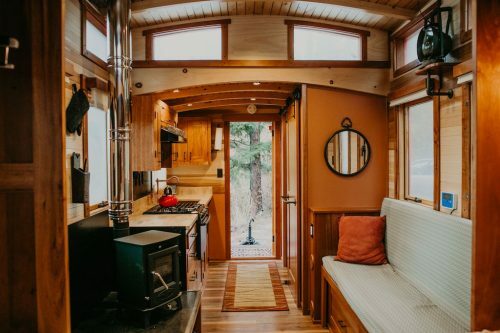 I’m more of a couch person than a recliner person but the beauty of tiny houses is how every person chooses exactly what feels like home to them. I think this is the first time I’ve seen the ladder stored horizontally! 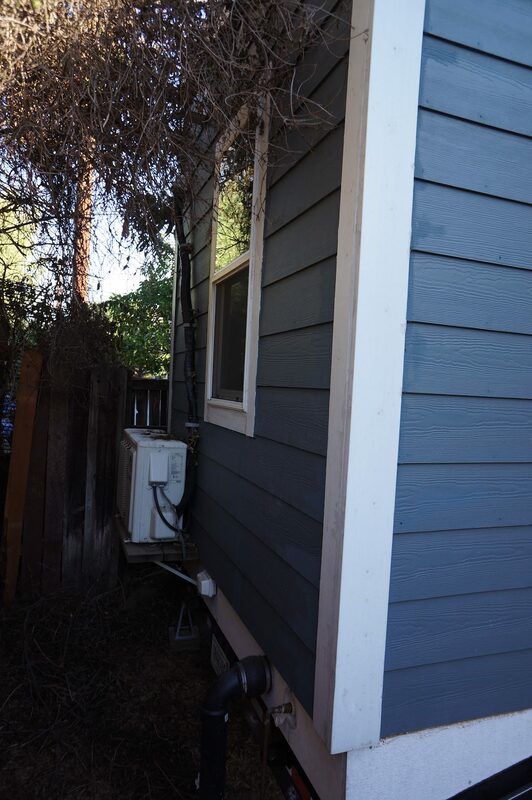 Just a helpful tip for tiny house builders: location of HVAC units are critical. The air handler inside in this home seems to be in a good spot for air throw (on an end). Mounting your mini split indoor air handler on a side wall can cause short run times of the ac, and not allow the air handler to have a good run time to remove humidity from the home, plus it may contribute to hot spots and cool spots as well when mounted on the side. Some THOW designs do not leave this choice to put an air handler on the end, so look at the HVAC MFR recommendations for air handler placement. Most will recommend at least 10 feet of not obstacles for air throw. 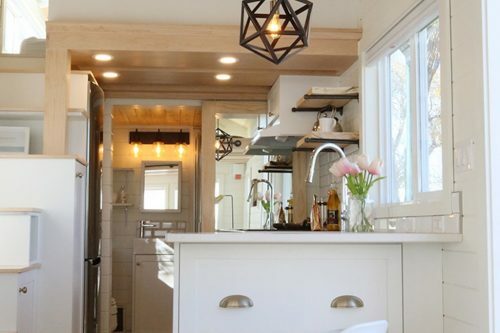 the average width of a tiny home is 8’6″. The outdoor HVAC unit for this home is in a secluded spot, which seems to be nice, however the MFR recommendation will advise to keep the unit off the wall so many inches for air flow to go through the outdoor unit coil. This unit here will not last long without problems. 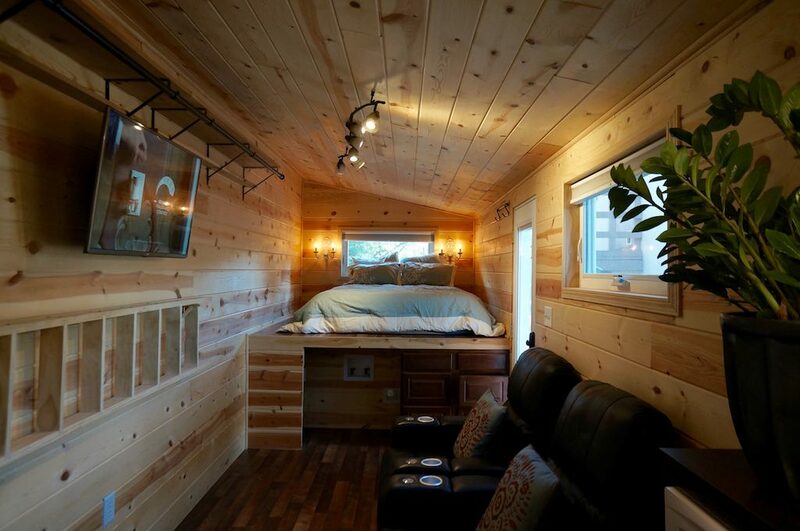 I love the bed location, and head room. That’s a smart way of using space. I would not change location of TV, I would just get a bigger screen and add surround sound.